Introduction The flame detection system is an important part of the furnace safety protection system (FSSS) of thermal power plants. The No. 2 furnace of Zhangjiakou Power Plant (30OMW boiler in Dongbuchang) was installed with the LY2O00-11 image fire detection system of Yantai Longyuan Power Technology Company. The use of optical fiber imaging, combustion theory, pattern recognition and image processing technology, in order to achieve a digital analysis of the pulverized coal burner and oil flame signal, issued a single burner flame signal, and has a combustion guide function, can Efficiently solve the problem of ordinary fire inspections that make it easy to "see" the flame. In addition, the system uses ordinary visible light fire detection for the monitoring of the oil burner, so it will not be repeated here. 1. Composition and basic functions of LY2O00-II system 1.1 System composition The system is mainly composed of flame image sensor, cooling air system, video signal distributor, flame image detector, flame image monitoring management system, flame image recording and playback system, communication module, etc. Partly composed. (1) Flame image sensor: It is composed of an objective lens, an image fiber, an eyepiece, a color CCD (camera), and a cooling part. No. 2 boiler 6 burners, a total of 24 pulverized coal burners. The system is equipped with a flame image sensor for each pulverized coal burner. (2) Cooling air system: It consists of 2 fans, air filter, conversion baffle, differential pressure switch and control cabinet, and provides cooling air to the flame image sensor. (3) Video distributor: Contains several â€œone-to-threeâ€ unit circuits that send the video signal of each flame image sensor to the monitoring management system, recording and playback system, and layer flame image detector. (4) Flame image detector: altogether 6 sets, each taking turns to image processing and identification of the corner coal burner flames, and finally emitting a switch signal of the coal combustion flame with no fire and fire, and its judgment parameters can be used. The application software in the workstation is modified and downloaded. (5) Flame image monitoring and management system: It mainly performs the functions of the single burner flame image and the whole furnace flame image real-time color display, pseudo color display, burner intensity histogram, history curve, status display of each burner, and so on. The entire device is managed. The flame image monitoring and management system is composed of a video signal switcher, a four-screen cutter, a color image capture card, a workstation, a sharer, and a multi-serial communication module. Among them, the main function of the workstation (upper computer) is to achieve combustion of the layers in the boiler. The real-time monitoring of the coal combustion flame, responsible for the control and management of video distributors, four-screen splitters, and layer flame detectors, etc., receive and display the data results for each layer of flame detectors. As the man-machine interaction monitoring terminal directly by the engineering staff responsible for the operation, provided to the on-site operation personnel clear boiler burner state and flame detection information. (6) Flame image recording and reproducing system: It is composed of a video recorder and a magnetic tape. It receives the dynamic flame image transmitted from the video distributor, and can automatically record the flame image for 24 hours and play it back on demand. 1.2 Basic functions The LY2O00-II system has the following basic functions: (1) The flame of the burner is directly observed by using an imaging fiber and a CCD camera. The flame detection is intuitive, sensitive, accurate, and has a strong discrimination capability. (2) The operating personnel can visually and clearly observe the real-time combustion status of each burner on a large-screen CRT placed in the main control room, perform combustion adjustment in time, and improve the combustion efficiency. (3) Using digital computer image processing technology, it can accurately and reliably output the â€œON/OFFâ€ switch signal of each burner flame, which can be easily connected to any type of boiler safety protection system. (4) Pseudo-color is used to display the temperature field distribution of the pulverized coal burner flame, and the operator can judge the combustion status according to the distribution of the temperature field. (5) Automatically record 24h flame images and play back as required to facilitate accident recall. Second, the principle of work Layer flame detector works shown in Figure 1. The flame image signal sent from the image fiber in the flame image sensor is converted into a video signal by a CCD camera. The video processor and converted into a digital image. 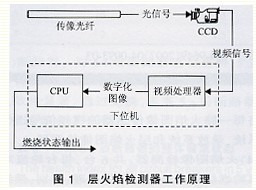 The CPU is responsible for calculating the digital image information according to a certain criterion system, and obtaining the burner flame ON/OFF signal and other diagnostic information. These messages are sent to the host computer by serial communication or entered into the FSSS by the switch output, so as to achieve a complete fire detection system. Each layer flame detector can process four video signals at the same time, and can monitor four burners in the same layer at the same time. 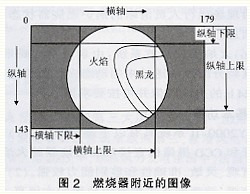 Near the pulverized coal burner, a circular field of view forms the image shown in FIG. 2 on the rectangular CCD target surface. Pulverized coal is ejected from the right side of the field of view to form a darker black dragon. Then as the temperature rises, it starts to catch fire and form a brighter flame. The image is digitized to form a digital image with 180 pixels on the horizontal axis and 144 pixels on the vertical axis. The pixel's brightness level is 256 levels (0~255). Actually, in order to avoid introduction of noise signals outside the visual field when calculating the criterion of ignition or not, an inscribed rectangle with a circular view is used, that is, a rectangular region defined by the horizontal axis, the lower limit, and the vertical axis in FIG. 2 . The four upper and lower limits of the area need to be set according to the specific conditions. The system first calculates the position of the flame front and the brightness of the flame based on the digitized image, and then determines whether the burner is burning or not. Both the flame brightness and the position of the flame front during normal combustion are set using two levels. Third, the parameter setting parameter setting is shown in Fig. 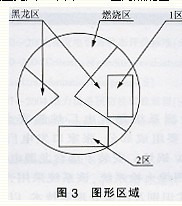 3, where "1" area is Heilong area, "2" area is burning area, and "1", "2" area is the characteristic area of â€‹â€‹detection and judgment. The flame state output criteria are as follows: (1) When the "2" area brightness value is greater than the "2" area brightness lower limit, the "1" area brightness value is less than the "l" area brightness upper limit value is the fire, "1" area brightness The value greater than the "1" zone brightness upper limit is no fire. (2) When the brightness value of the "2" area is less than the lower limit of the brightness of the "2" area, the furnace is turned off. When the limit value is selected, the brightness upper limit value in the "1" area is generally 110 to 170. According to the situation can be adjusted. The lower limit of brightness in the "2" area is generally 40-80. The sizes of "1" and "2" zones can be arbitrarily scaled to the optimal size and position by running. IV. Application and Improvement (1) From the operating conditions of the system since it was put into use, the image sensor requires high cooling air, the cooling air must have sufficient wind pressure and air volume, and it must be sufficiently clean so as to ensure the transmission. Like fiber optic image quality and lifetime. When the sensor cooling fan outlet pressure is less than the setting value, another cooling fan will be automatically started immediately. At the same time, the air pressure insufficiency alarm signal will be sent to remind the operating personnel. At this time, the operating personnel should deal with it quickly, otherwise the optical fiber will be burned. At the initial stage of system operation, once the filter was clean, the cooling air pressure was low and the cooling air was unclean. As a result, the optical fiber was contaminated and affected the image quality. This led to two layers of fire detection and misjudgement of the coal mill accident. To this end, the equipment was rectified, the cooling fan filter was replaced, and the frequency of filter cleaning and the inspection of the cooling fan were enhanced. In order to ensure the reliability of the sensor cooling air, a 2-way power supply is provided for the cooling fan. (2) During use, the image sensor should be checked regularly. During each inspection, the process of inserting and inserting the optical fiber should be easy, otherwise the optical fiber protection pipeline may be blocked, if the blockage occurs, the optical fiber protection pipeline must be opened; the temperature end surface of the optical fiber should be smooth and smooth, if the uneven area exceeds 30%, Fiber should be replaced, otherwise it will lead to accidents due to fire detection. When removing the fire detector probe, clean the carbon dust on the inner surface of the probe with a soft cloth; check that the protective glass in front of the photodiode should be bright, clean, and free from damage. Replace it if it does not meet the requirements. After 2a is used, if 30% of the optical fibers have moderate delamination, they should be replaced in time. In addition, each inspection should be cleaned and wiped by the objective lens of the image sensor. Otherwise, dust accumulation and coking will occur on the objective lens, affecting the image quality. In the minor repair of Unit 2 in 2004, it was found that the nozzles of the C3 (C3 No. 3 horn) burners fell heavily and were tilted by about 30 degrees more than other nozzles. This was caused by a shorter black dragon on the display screen and a misjudgment by the fire detector. root cause. Therefore, the inspection of the position of the nozzle of the burner is strengthened during inspection and repair, and the rectification is performed when the position is inappropriate. In the minor repair of Unit 2 in 2005, the operating system software of the workstation was upgraded to Win2O00, which solved the crash phenomenon of the original Win98 system and upgraded the flame detection application software version to V3.3, which solved the problem that historical data could not be automatically cleared periodically. Insufficient disk space. (3) The debugging experience summarizes the following experience: The commissioning should be carried out after the boiler has ignited the pulverized coal and carried the load. Because the actual flame shape and position of each pulverized coal burner is affected by the air distribution, it may be offset from the static, and must be adjusted. The eyepiece angle or the camera focal length make the image reach the sharpest point. At this time, the parameters can be set. For each parameter modification, there should be detailed records, through the comparison of different records, to find the optimal parameters. According to experience, it is advisable to set the "l" zone brightness upper limit value to 150 or so, and the "2" zone brightness lower limit value to 50. When "1" zone size or position is selected, the brightness value of the zone is stable and does not "peek" "It is advisable that the size and position of the "2" zone be selected in the combustion zone. V. Conclusion LY2O00-II image fire detection system is better applied, the flame image is clear and intuitive, "fire and fire-free" judgment is accurate, can solve the problem of common fire inspection is easy to "sneak" the flame, the disadvantage is the effective life of optical fiber transmission too short. In the minor repair of Unit 2 in 2005, improvements were made to the transmission optical fiber. A new type of high-definition image sensor was replaced on the 2nd and 3rd floor burners. From the standpoint of using more LEDs, it was significantly better than the optical fiber imaging sensor. Due to the reduced image transmission links, the sharpness of the flame image is significantly improved. Snoworld screw type Automatic Ice Storage can be used for small ice quantity storage. It is designed for food and aquatic processing and medical field, where require high sanitary requirement. It has several features. 1. Factory pre-assembled module, less time and labor for installation and commission. 2. Unique screw type ice delivery structure, which guarantees smooth ice transmit and no blocking. 3. Stainless steel material for all interior parts. No mechanical rotation abrasion and contamination. Few malfunction and long use life.